Naypyidaw, Feb 13 (IANS) The Myanmar police fired rubber bullets and used tear gas and water cannon to disperse minority rights activists protesting against the installation of a new statue of General Aung San, father of State Counsellor Aung San Suu Kyi and considered the architect of modern Myanmar. Aung San, who represented the Bamar majority community, is considered the hero of Myanmar's independence struggle against the British and a pioneer in establishing a federal state with equal rights for all ethnicities, a promise that according to minorities was never fulfilled. In late January, the installation of a statue of Aung San on horseback in Loikaw, capital of the western Kayah province, mostly inhabited by the Karenni minority community, led to protests that spilled into February, Efe news reported. On Tuesday, the Myanmar police had to use teargas and rubber bullets to disperse thousands of protesters, who had gathered near the new statue in Loikaw to protest. Several protesters were injured during the demonstration that took place on Union Day, the anniversary of Aung San signing an agreement with leaders of three ethnic minorities in 1947, which was key to the establishment of an independent Myanmar. The military junta, which ruled Myanmar between 1988 and 2011, had almost entirely erased official homage to Aung San - who had also founded the Myanmar military and was assassinated by political rivals just months after independence - since his daughter Suu Kyi was leading the opposition to the military dictatorship. However, since Suu Kyi came to power, the figure of her father has again occupied centrestage, with his image expected to be printed on Myanmar's currency notes for the first time in three decades. Members of some minority groups perceive this as a "threat" to their own cultural roots and figures. "The government should consult the local ethnic people before erecting statues. We don't hate Aung San, but we should have the opportunity to raise statues to honour our own ethnic heroes," Ko De De, spokesperson of the Union of Karenni State Youth, told Efe. In mid-2018, the face of an Aung San statue was stained with green paint in Myitkyina, capital of the southern Kachin State, while in the central Sagaing region, Naga ethnic groups had also protested against a monument for the general. Ethnic minorities in Myanmar account for more than 30 per cent of its 53 million population and have been for years demanding greater autonomy under the federal structure. The Myanmar military has been fighting a civil war with dozens of minority armed groups since independence. 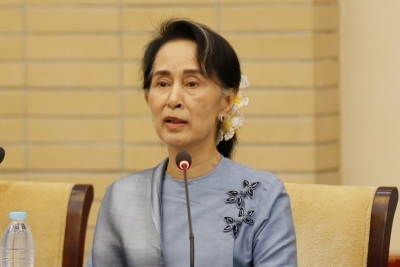 Although Suu Kyi has tried to resolve the conflicts through the peace process, there has not been much progress. Myanmar has been going through a democratic transition since 2011, after almost half a century of military rule.